The 50 years experience acquired by 'Maccravats' in design and manufacture of company ties and club ties, combined with the latest advances in technology, puts us in a unique position to produce ties at competitive prices without sacrificing quality. Our range extends from standard polyester to hand-made silks made from quality woven fabrics. Badges - embroidered, gold & silver wire, cast metal & enamel. Enquiries will be dealt with promptly. A selection of design ideas is shown above. 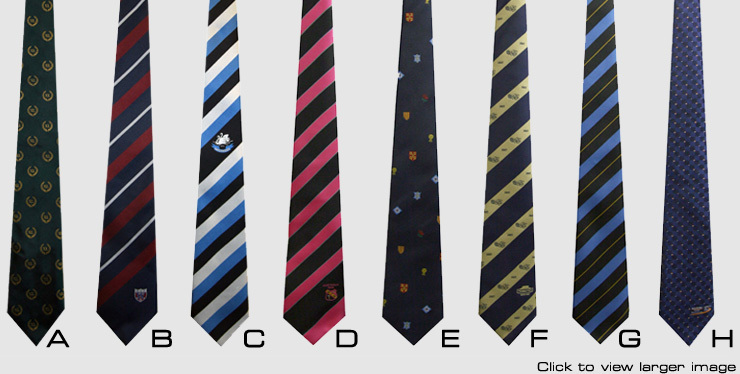 Once you have chosen the example you prefer and given us a copy of your logo and the colours to be incorporated, we are in a position to design your tie in full colour. Send us your logo and our Art Department will produce a coloured sketch for your approval. For more information on our products and services, speak to our customer advisors on 01625 423316 or please complete our contact form available by clicking here. Made to your design, our Presentation Table Cloths are made to fit your particular table in heavy wool serge. 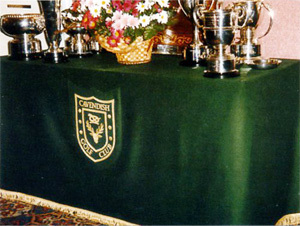 Cloths can be made to fit individual tables and are available in a good selection of colours. Your Club badge is handmade in gold or silver wire. Prices are available on application, contact us on 01625 422079 or please complete our contact form available by clicking here. Produced in either gold or silver wire, these badges are hand made and can therefore be personalized with dates, titles and names. Let us have sight of the logo or logos you wish to incorporate. Give us the ground colour you prefer and any other colours to be included. Before weaving the fabric for your order we will first submit a coloured sketch for your approval. On receipt of approval, we will then weave the cloth sample. After you have confirmed that this is accurate, we will then weave the fabric for your order.